@Malaysia | Get Your Grub On! I was on a spontaneous one-day / one-night business trip to K.L. and after our meeting the colleagues there took us out for dinner to ‘alexis’ at Mid Valley. The place looked plain, no thrills just like any other mall restaurant and had a fairly mixed and quite worrying, so called intercontinental menu. 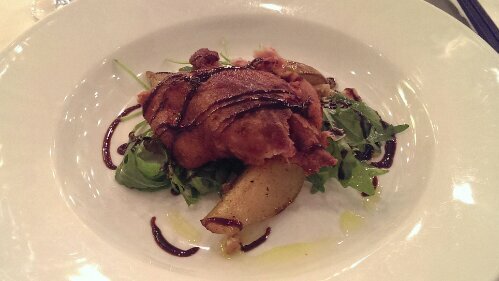 For starters I had the ‘Duck Confit‘. Yes, that’s right, ‘Duck Confit‘ as an appetiser, probably one of the best ideas I have come across in a long time. I’m not quite sure how authentic it was, since I had this rather seldom as a main but as it was in fact wickedly awesome, I couldn’t give a lesser damn. It was super crispy crackling on the skin with the meat still moist and savory and the balsamic reduction, some arugula and the caramelized pears were a brilliant sweet-sour-bitter contra play. A-freaking-mazing. 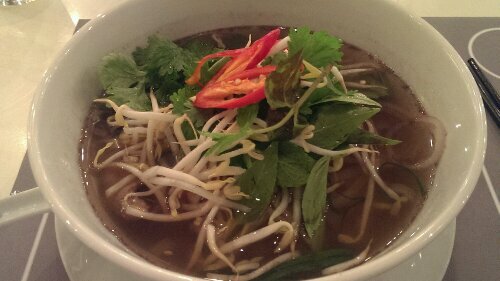 After my fancy and unusual large french starter I followed a colleague’s recommendation and ordered the ‘Pho Bo‘ still keeping my expectations low. It turned out there was no need to be conservative for the bowl was huge and piping hot with that lovely cinnamon fragrance steaming up from the top. The noodles were the thicker kind, awesome chewy and the meat was plenty and lean. On top of that they handed loads of proper pho condiments like sprouts, basil, mint, chilli and lemon, which I miss so often. Now that’s how it’s done. Well this place was a nice culinary surprise. With its’ unpromising facade and it’s weird all-around-the-globe-menu it nearly got me fooled and disappointed at first just to knock me off my dining shoes with some outstanding foods and heavy ‘Pinot Noir‘. A good night. Finally it was ‘Bak Kut Teh‘ night since I had heard so much about the fantastic K.L. herbal pork ribs that I always neglected to try because I was a very patriotic supporter of the peppery version that’s so popular in Singapore. Anywho, my old colleague friend, who lives down here now, picked me up and we took a little ride to ‘Ah Wang Bak Kut Teh’ in a picturesque location at a roadside, under a bridge. A bit f@#&ed up but in a “don’t judge the book by its’ cover” kind of way, still comfortable, not yet repellent. That dish they served was brilliant, even that I could’ve lived without the thin layer of beancurd skin, the broth was amazing with a dense and strong herbal pork taste. The ribs were lean, soft and satisfyingly meaty and we also ordered some enoki mushrooms aside which made a fantastic add-on to the soup that I haven’t had before. I loved this stuff and all in all it was a lovely evening at a lovely dodgy place. Off to dessert. What’s up with all the ‘Expresses’? Walking around the foot outlet cramped basement arcade connecting Mid Valley and the Gardens Mall seeking for some dinner inspiration gave us a severe case of sensory overload. We were tired and couldn’t really make up our mind and since my friend just wanted something light and healthy we ended up at ‘Zun Express’ a Chinese herbal soup place. The ‘Ginseng Herbal Chicken Soup‘ I had was actually pretty good, I mean it was just boring chicken soup but seemed to be perfect when you’re down with the flu or something; strengthening I guess and the little chicken meat that was in there was tender and tasted ok. All in all this wasn’t a very filling experience and I skipped the rest of the non soupy dishes on the menu because despite them all being called healthy, 99% also had the word “fried” in their description. Let’s just say I was happy there was a ‘Hui Lau Shan‘ just around the corner to fill up the leftover space with awesome moussy mango. I was on a training course in Kuala Lumpur for the week and for whatever reason my German colleagues just loved the foodcourt at the upper floor of Mid Valley Megamall and suggested to go back there for dinner tonight. Was I stoked? Maybe not, but since they were the guests I tried to accommodate to their wishes. Somehow tonight they couldn’t decide for any of the stalls here and so we settled for ‘Express Teppan-Yaki’ one of these ten minute teppanyaki experiences in the entrance corner of the ‘Food Junction’. I ordered the ‘Beef Tenderloin‘ and asked for some extra chili to be added. Everything here was prepared the same way and no matter if pork, chicken, seafood or beef, all was topped with the same tangy gravy. My meat was perfectly medium and tender and, together with the generous amount of garlic and the stinging chili, made up some simple and tasty comfort food and the crunchy salty greens and sprouts added some contrasting flavours and textures. It was nothing spectacular nor too memorable but a nice and different way to get in some meat rather than just steak-ing it up.